Price: USD 1190 per tour. Prices are fixed for up to 4 persons. We do not provide additional passengers to fill up the 4 passenger quote. 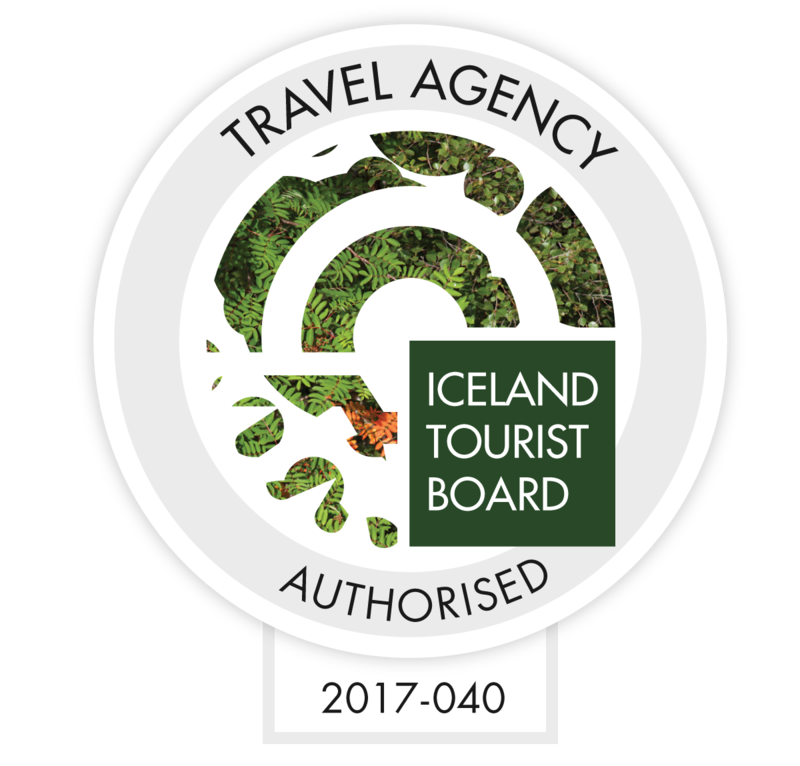 This tour is also available for ≥5 passengers please contact for a price quote. 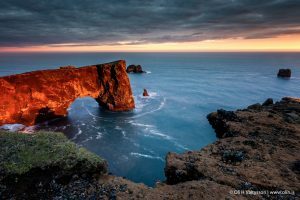 The South Coast of Iceland is one of Iceland´s most scenic regions. From Reykjavík en route to Vík, which is a small but charming village surrounded by magnificent bird cliffs. 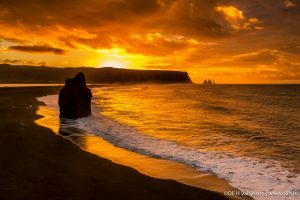 The known Reynisfjara shore, close to Vík in Myrdalur, is widely regarded as the most impressive shore in Iceland. 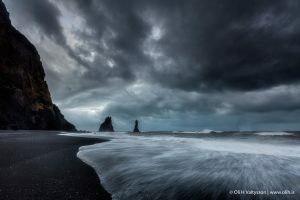 Reynisfjara is a black pebble beach featuring an amazing cliff of basalt columns resembling a rocky step pyramid, called Gardar, and the basalt sea stacks Reynisdrangar who according to folklore were trolls before the sunlight broke and turned them into stone. The area is rich in birdlife, such as; puffins, fulmars and guillemots. The small peninsula Dyrhólaey (120m) is not far from the village Vík. 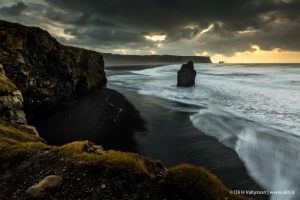 In the sea in front of the peninsula is a gigantic black arch, which gave the peninsula its name Dyrhólaey (meaning: the hill-island with the door). Formerly when the coast line was higher in the country the formation was an island of volcanic origin, which explains why it´s called “ey” (Dyrhóla-ey) as “ey” means an island (today it´s more common to say “eyja”). The view from up there is very spectacular extends far in all directions. 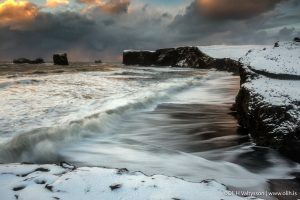 In the summertime, this is a great area to explore puffins and their nests on the cliffs of Dyrhólaey. 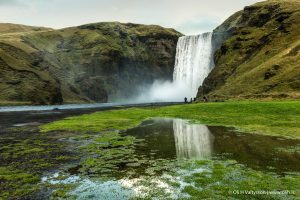 We stop at Skógar to see the waterfall Skógafoss, it is one of the biggest waterfalls in the country with a width of 25 metres (82 feet) and a drop of 60 m (200 ft). This waterfall falls off the cliffs of the former coastline. After the coastline had receded seaward (it is now at a distance of about 5 kilometres (3.1 miles) from Skógar), the former sea cliffs remained, parallel to the coast over hundreds of kilometres, creating together with some mountains a clear border between the coastal lowlands and the Highlands of Iceland. Due to the amount of spray the waterfall consistently produces, a single or double rainbow is normally visible on sunny days. Waterfall Seljalandsfoss in the river Seljalandsa is a wonderful waterfall and truly magical. Seljalandsfoss has a narrow cascade but is one of Iceland’s highest waterfalls, at 63 meters (200 ft) it drops over the cliffs of the former coastline. The waterfall is highly picturesque and you´ll have the option of walking behind the water as it drops down to earth. This experience makes the visit a magical and romantic one. 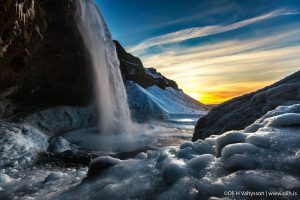 The South Coast of Iceland is very popular with Hollywood… they come here often to film Movies like: Noah’s ark, The secret life of Walter Mitty, and more. This tour may at one point operate in reverse direction, depending on weather and other conditions. 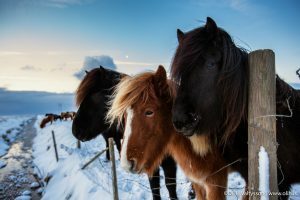 It is popular to extend the South Coast of Iceland tour to a Multi-Day tour for 2-3 days as the South-coast offers a wide range of sights and footage. 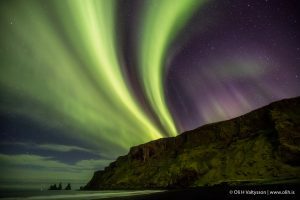 During the winter months, when the forecast for Northern Lights (Aurora Borealis) is promising this trip is ideally combined with a Northern Lights tour. Be prepared to stay up late and experience magic. Ask our guide for further informations. We reserve the right to alter the itinerary according to weather and road conditions. Cancellations must be made 12 hours prior to departure. No shows are fully charged.